Marvel has not solicited a new Star Wars reprint since Lando #1 earlier this month. It is possible demand for Star Wars issues has subsided, but I think this has more to do with the collections Marvel has forthcoming for many of the Star Wars titles. By withholding the reprints, Marvel is building up a demand that will be satisfied with the trades. My guess, the upcoming Star Wars: Shattered Empire mini-series will see a return of reprints for a Star Wars title unless Marvel has plans to issue the trade quickly after the mini-series wraps up. The first Star Wars Celebration took place in 1999 in Denver, Colorado a few weeks before the release of the Phantom Menace. These events are conventions that are attended by Star Wars fans, actors, Lucasfilm, and licensees. In August 2010, Orlando, Florida hosted Star Wars Celebration V. Many licensees were on hand, including Hasbro with an exclusive boxed set of Camie and Fixer action figures. This box set also includes Star Wars Comic Pack #47. 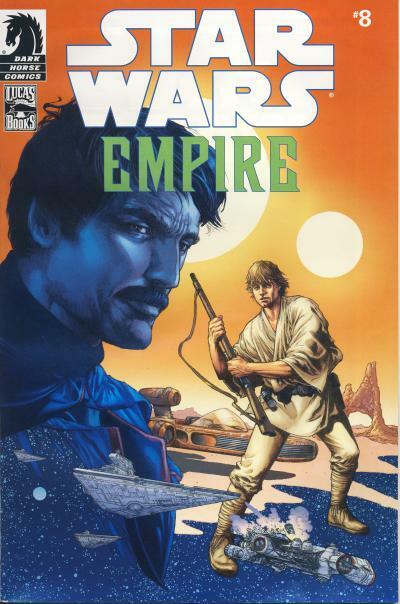 The comic reprints Star Wars: Empire #8 published by Dark Horse Comics. Loose, this Star Wars Comic Pack issue fetches from $5 - 10 on eBay. The comic it reprints usually goes for $2 - 4. 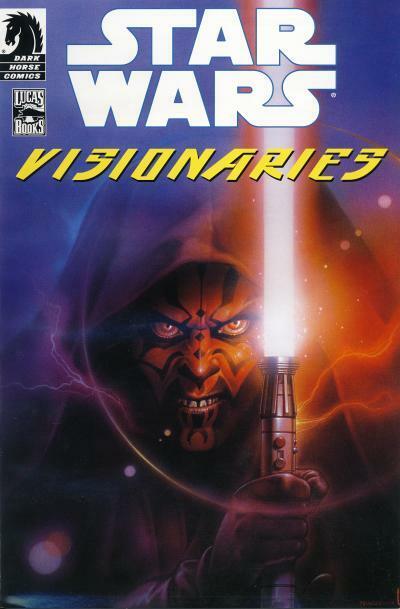 The first time Darth Maul survived his bisection on Naboo by Obi-Wan Kenobi occurred in an original Star Wars graphic novel called Star Wars Visionaries published in 2005. This graphic novel contains 10 non-canon stories by concept artists who worked on Revenge of the Sith. In the first and arguably best story in the graphic novel titled Old Wounds, the 3-4 year old Luke Skywalker and Owen Lars are approached by a menacing Darth Maul with cybernetic legs. Maul went to the Lars homestead to draw Obi-Wan Kenobi out of hiding and we learn Maul has been tracking Obi-Wan's whereabouts for some time before ending up on Tatooine. Maul has an intense hatred of Obi-Wan for what he did to him on Naboo and the two engage in a prolonged lightsaber fight. Eventually, Maul is bested and when Obi-Wan hesitates to kill Maul, Owen shoots Maul dead. It is a powerful story and Maul's resurrection in The Clone Wars borrows several elements from this story namely his immense hatred of Obi-Wan Kenobi and the cybernetic legs. This story is reprinted in Star Wars Comic Pack #56 which came in a 2010 San Diego Comic-Con exclusive boxed set with a Darth Maul and Owen Lars action figure. Loose, this Star Wars Comic Pack issue is the most expensive fetching from $10 - 15 on eBay. The graphic novel this comic partially reprints usually fetches $5 - 10. For fans of the Expanded Universe, the first Star Wars anthology movie's title, Rogue One, immediately brings to mind the Rebel starfighter squadron, Rogue Squadron. Introduced in The Empire Strikes Back and further expanded on in Dark Horse's Star Wars: X-Wing Rogue Squadron title and Bantam's Star Wars: X-Wing books, Rogue Squadron is led by Wedge Antilles. Wedge is the only other X-Wing pilot beside Luke Skywalker to survive the attack on the Death Star and appear in all 3 original movies. As information about the new movie is leaked, it is becoming unlikely the movie will be about the Rogue Squadron that Star Wars fans are familiar with. 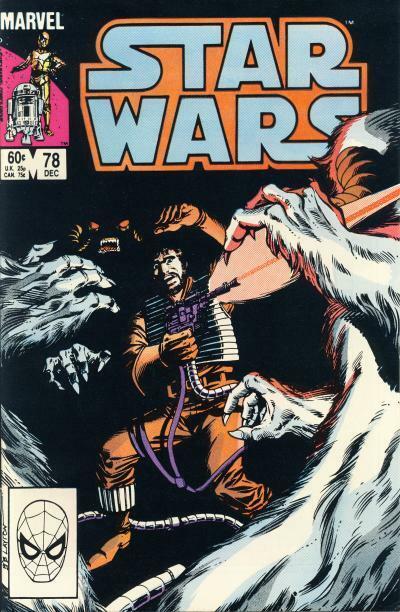 A Marvel Comic Star Wars issue that never fit with the later canon of Rogue Squadron occurred in issue #78. Titled Hoth Stuff!, this story tells how Wedge Antilles and Wes Janson were stranded on Hoth following the Empire's assault on the Rebel base. Wes is Wedge's rear gunner in a Snowspeeder and together the two bring down the first AT-AT Walker during the battle on Hoth using a harpoon and tow cable. The biggest contradiction this story has with established lore is Wedge Antilles relationship with Luke Skywalker. In the issue, Biggs Darklighter's importance as Luke Skywalker's best friend from Tatooine is grafted onto Wedge. Having Wedge Antilles be Luke's friend from Tatooine is never mentioned in any Star Wars story before this issue or since. In fact, the deleted Bigg's scenes are included in the Star Wars movie adaptation, so for readers of the title, this new information contradicts what they already know. It is easy enough to see why future authors dismiss this entire story as non-canon. Canon aside, the story is not a particularly strong one. Luke's eagerness to find Wedge regresses Luke's character to his A New Hope persona and not the mature person that emerged from his ordeal in The Empire Strikes Back. Highlights in the story are the inclusion of Tauntauns and Wampas, as well as an appearance by Kenner Toys' MLC-3 mini-rig. Disappointingly, at one point in the story Wedge and Wes enter the cockpit of a fallen AT-AT, but instead of the cool AT-AT drivers shown in the movie, normal Stormtroopers are shown at the controls. There is promise in a return to Hoth tale, unfortunately this issue does not live up to expectations. Darth Maul is one of those rare Star Wars characters that saw very little screen time but quickly became a fan favorite. Darth Maul was introduced as the apprentice to Darth Sidious in The Phantom Menace and was ordered to pursuit Queen Amidala. Later in the movie, he would catch up to the queen and her two Jedi escorts, Qui-Gon Jinn and Obi-Wan Kenobi, on Naboo. There he would kill Qui-Gon, only to be killed in turn by Obi-Wan. Except he did not die... 13 years after we saw Darth Maul bisected and killed, he was resurrected in Star Wars: The Clone Wars animated series. At the end of Season 4 in early 2012, we would learn that Darth Maul was not killed, but instead survived. Unfortunately for Dark Horse Comics, Darth Maul's demise in the movie limited the number of comics they would publish with the character. 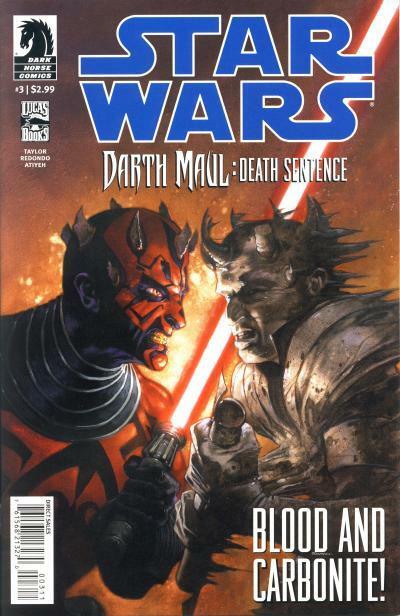 There was the 4-issue The Phantom Menace movie adaptation, a 4-issue limited series titled Darth Maul in 1999, a few appearances in the Star Wars Tales title one of which saw Maul square off with Darth Vader, and a story in Star Wars Visionaries. 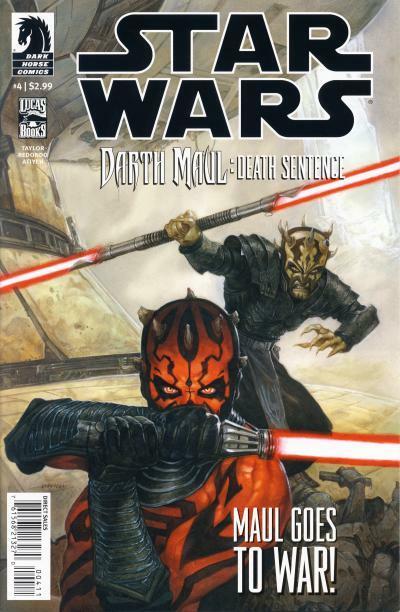 It was until his return in 2012 that we saw another Darth Maul comic, the 4-issue limited series, Star Wars: Darth Maul - Death Sentence. The Clone Wars animated series gave Darth Maul a background and a new pair of mechanical legs. 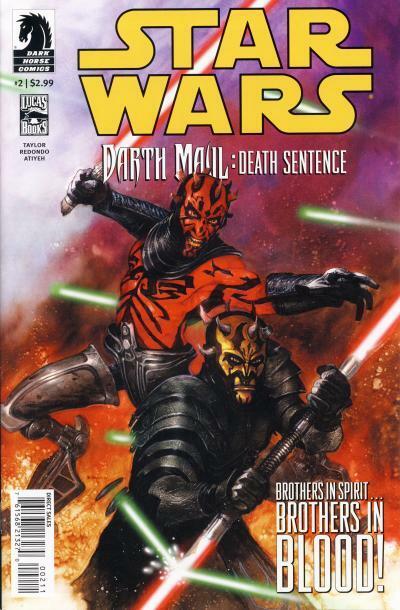 The other character that is the same species as Maul on the cover of the comics is Darth Maul's brother, Savage Opress. 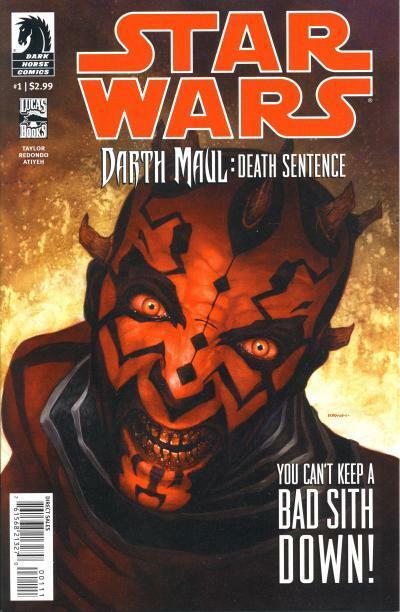 Dark Horse Comics would publish one more Darth Maul mini-series in 2014, Star Wars: Darth Maul - Son of Dathomir. Unlike the other comics published by Dark Horse, this last mini-series is part of the new Star Wars canon. Released in September 2008, Star Wars: The Clone Wars - Shipyards of Doom is a digest-sized graphic novel that came out a couple of weeks before The Clone Wars animated series debuted on the Cartoon Network. 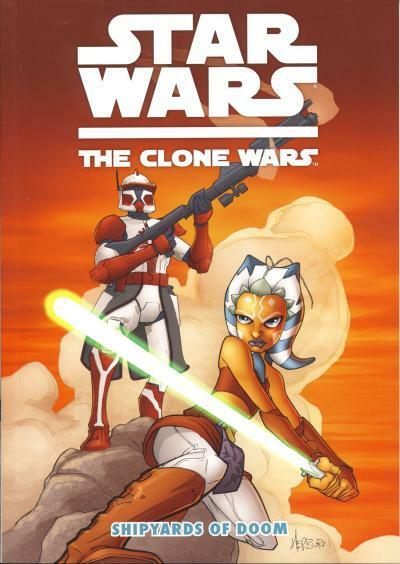 This is the second The Clone Wars offering Dark Horse released in September 2008; the ongoing Star Wars: The Clone Wars series also started that month and ran for 12 issues ending in May 2011. 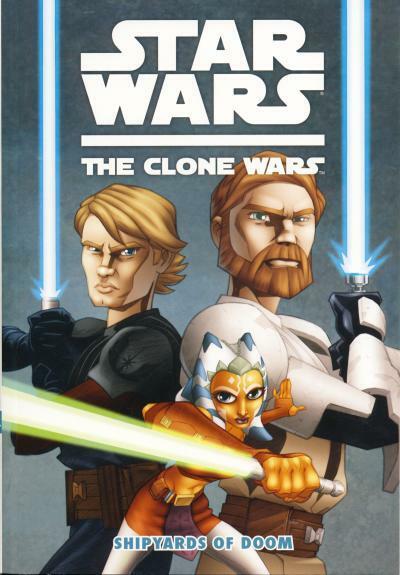 This digest-sized offering was the first in a series of The Clone Wars digest-sized graphic novels that ran for 11 issues until June 2013. The Clone Wars animated series was preceded by The Clone Wars animated movie which was shown in theaters starting in August 2008. When the DVD/Blu-ray for The Clone Wars movie was released in November 2008, as is common for movies of this genre, several chain retailers had exclusive offerings to accompany the DVD/Blu-ray. Target's exclusive included the Shipyards of Doom graphic novel with a different cover. I prefer the Target exclusive cover. On the regular cover, while Anakin Skywalker and Obi-Wan Kenobi are not meant to be in scale with Ahsoka Tano, the uniform coloring applied to all the characters makes Ahsoka look small. Neither version of this digest fetches more than the other version. Copies typically sell for $4 - 8 on eBay. 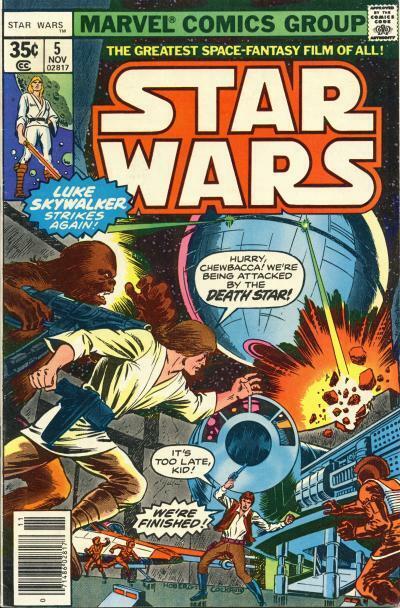 Luke and Chewbacca are taken from the cover of Star Wars #3. 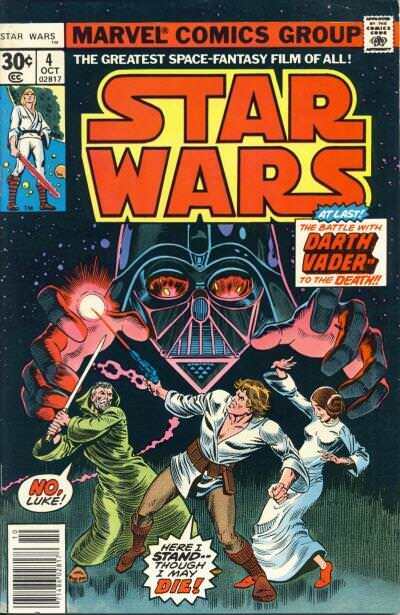 Luke's large hands that are encircling the Stormtroopers are Darth Vader's hands from the cover of Star Wars #4. As for that piece of technology behind the large left hand, that is part of the Millennium Falcon from the cover of Star Wars #5. I would not be surprised if the images of the Stormtroopers and the Dewback are lifted from other comic art as well. These two Indonesian comics are actually the same comic with different covers. One has a photo cover and the other an art cover. This is a marketing tool that many modern publishers use with comics in the U.S. For example, Star Wars Tales #5 - 25 released by Dark Horse Comics contain both photo and art covers. It is cool seeing this with a foreign comic from the late 1970s/early 1980s. Was it used to entice collectors to buy more than one copy? Or did the publisher feel that offering two different covers would attract more readers? Maybe one was published earlier than the other? In addition to having the same interior as each other, these comics also have the same interior as the two Star Wars comics published by Yayasan Karya Bhakti Bandung in July and September of 1978 meaning these comics are a collection or album. 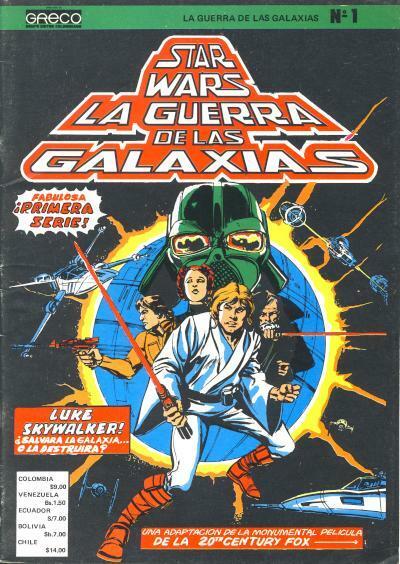 It is probable the unsold returns of those issues were repackaged as this comic with a new wrapper cover which is common in many foreign countries. In this case however, the comics were repackage with two different covers and the original covers are not included inside the collection. If you recall, the comics this collection contains were published out of order. The first issue contains Marvel Comics Star Wars #4 -6 and the second issue contains Marvel Star Wars #1 - 3. 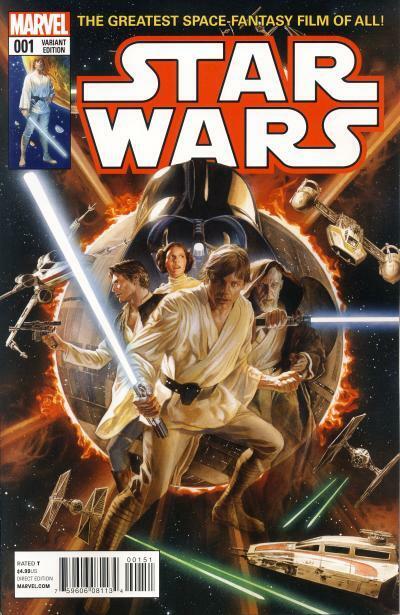 Like those comics, this collection also publishes the content out of order with the first half of the book containing the last half of the Star Wars adaptation and the second half contain the first half of the adaptation. It isn't clear why the comics were packaged this way, but at least the publisher was consistent. 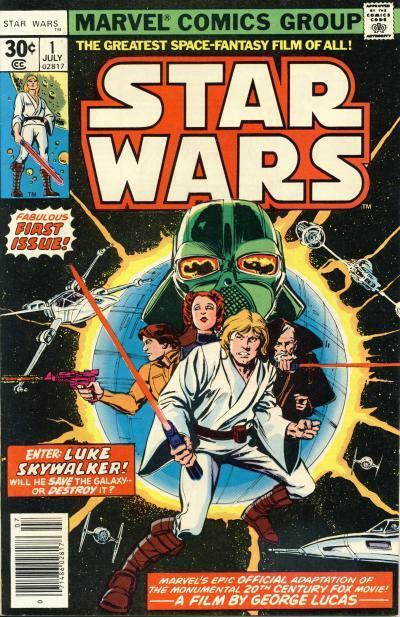 In two previous postings about Indonesian Star Wars comics, we looked at digest-sized comics that contained reprints of Marvel Star Wars content and digest-sized comics that contained original Star Wars content. 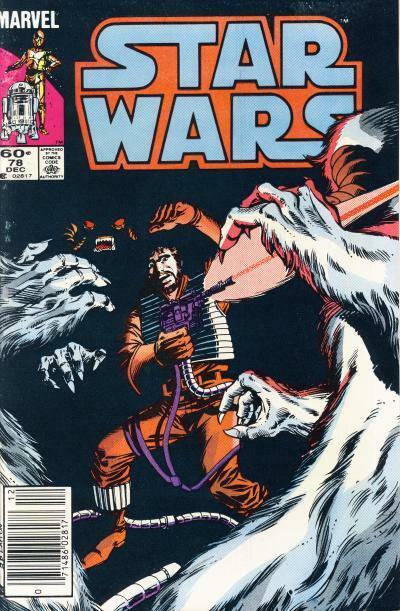 What all those comics have in common is cover art that was taken from Marvel Star Wars covers. These following comics are also black and white digest-sized comics, but they all contain original cover art. This comic contains a lead Star Wars story and another non-Star Wars backup story. The title is Planet Kelabu or Grey Planet. 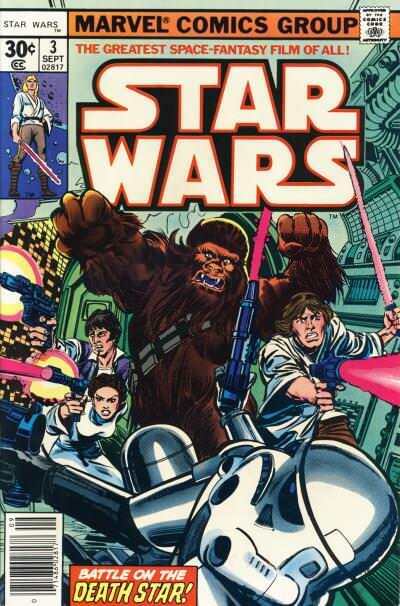 The cover has the vanishing point version of the Star Wars logo flanked by a bust of Darth Vader and Chewbacca. In the foreground is an X-Wing and the Death Star. The art on this cover is very apropos of the interior art for many of these original art issues. This comic has a tenuous connection to Star Wars. In the first story, titled Tanah Buang or Waste Land is a Luke Skywalker-like male character shown on the cover and inside. In the story, he starts off wearing the infamous white tunic that Luke wears in Star Wars. And it looks like the character is holding a lightsaber on the cover. I am not sure who the female character is; maybe it is Princess Leia but it is a poor depiction of her. Inside, even though the story is black and white, this character has black hair so the portrait on the cover at the top is interesting since it shows her as having blonde hair. 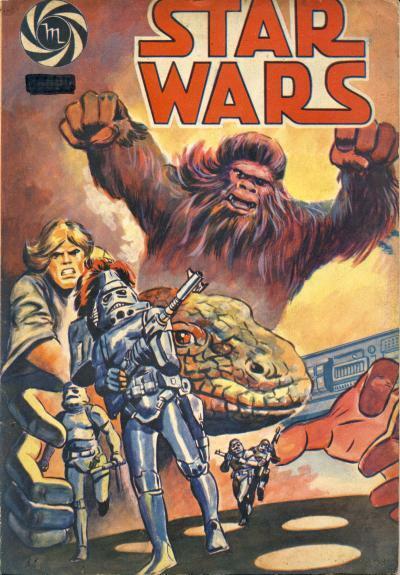 The ape looking creature on the cover is not Chewbacca, but the villain of the tale. Outside of Luke Skywalker and the lightsaber, the only other relationship this content has to Star Wars is the spaceship the main character is flying looks somewhat like the Millennium Falcon. If the previous comic had a loose connection to Star Wars, this comic only has the Star Wars logo and the cover art going for it. The cover is titled Planet Liar or Wild Planet and the lead story has the same title, but it is not a Star Wars story. In fact, there is no Star Wars story whatsoever inside this comic! The cover has a decent depiction of the principal characters: Luke Skywalker, Princess Leia, Han Solo, Chewbacca, and Darth Vader. Leia is sporting an incredibly short dress and Chewbacca looks like he had the hair on his feet shaved. 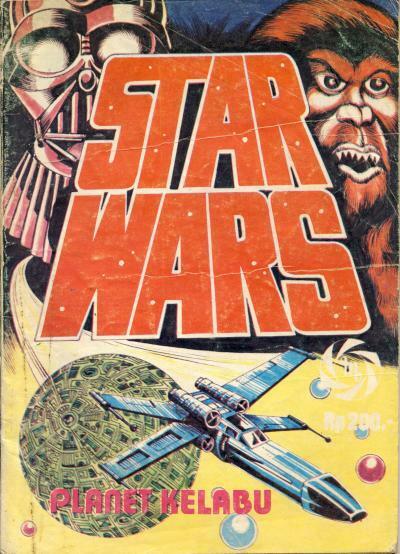 I updated Retro Foreign: Indonesian Star Wars (Part 4). I added two new Indonesian comics to this posting, Star Wars: Planet Merah and Star Wars: Satelit Penghisap. It is well know among fans that Biggs Darklighter had a larger role in the original Star Wars movie but George Lucas removed scenes of Luke Skywalker interacting with his best friend on Tatooine for story pacing. Lucas decided the beginning of the movie should be about the plight of C-3PO and R2-D2 and the events that lead to their first encounter with Luke. 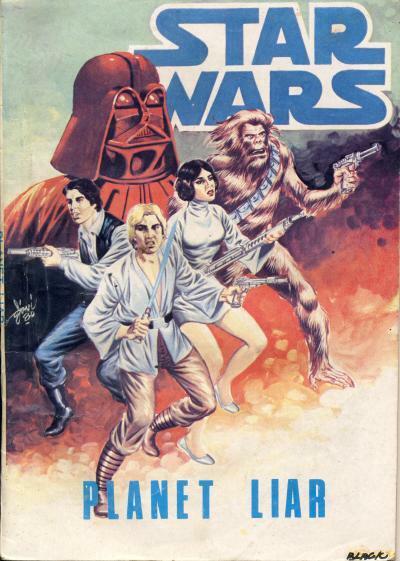 Many of the deleted scenes are shown in Marvel Comic's adaptation of Star Wars. 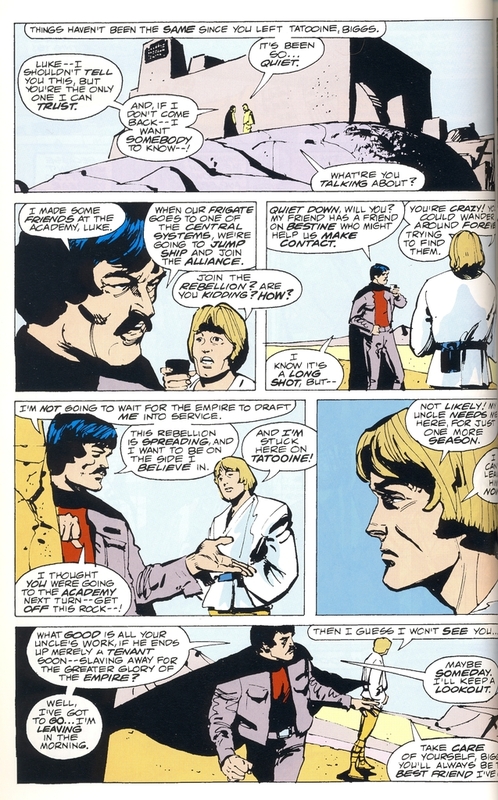 In this deleted scene from Star Wars #1 page 5, Luke races into Anchorhead to tell his friends about the space battle he witness through his macrobinoculars. Camie and Fixer are at Tosche Station as well as Biggs back from the Imperial Academy. Luke first witnesses the space battle in this deleted scene from the bottom 2 panels on page 2. 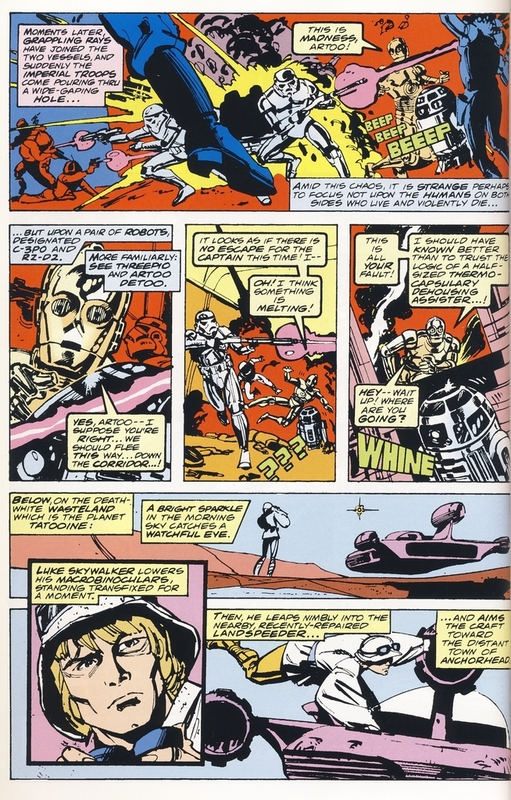 The faulty WED Treadwell repair droid is absent in the comic adaptation. On page 8, Luke has a more personal conversation with Biggs. Biggs tells Luke of his plans to join the rebellion and Luke expresses his frustration at being stuck on Tatooine. Marvel had adapted movies to comics before Star Wars. Planet of the Apes was adapted to comics in the magazine of the same title in the early 1970s and later reprinted in Adventures on the Planet of the Apes #1 - 6. Logan's Run #1 - 3 contains the movie adaptation. Since the advent of the mini-series, most movies are adapted in 4 issues like Return of the Jedi #1 - 4. The Marvel Star Wars adaptation works well and helped spur a generation of Star Wars fans because it had the larger page count to let the story breath. 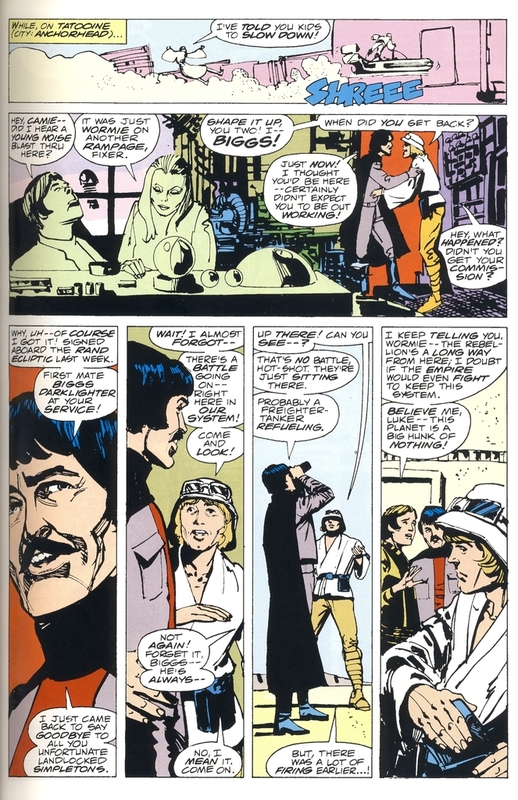 I have no doubts if Star Wars was adapted using 3 or 4 issues like Logan's Run or Return of the Jedi instead of 6 issues like Planet of the Apes, many of the deleted scenes we are able to read in the comic would have also ended up being cut including these scenes of Biggs on Tatooine. The Comics Chronicles has released the July estimated sales and two of the Star Wars titles are showing they are going to be perennial top 10 titles for the foreseeable future. Star Wars: Lando debuted to strong numbers and placed 2nd on the charts. This makes Lando #1 the 4th best selling Star Wars issue from Marvel in the modern era, behind Star Wars #1 and 4 and Darth Vader #1. Initial reactions to the 1st issue were positive and it is likely the Lando mini-series will finish stronger than the Princess Leia mini-series which received a less positive reception. Since the main Star Wars and Darth Vader titles both have over 6 months of sales data, some observation can be made. Retailers under-ordered the 2nd and 3rd issues of both these titles and over-ordered the 4th issue in April attempting to correct the mistake. Princess Leia benefited from this over-ordering in April as well with higher sales numbers on the 3rd issue. It is unlikely either title will ever match the sales for the 1st issues, but both titles gained about 6,000 more sales in July over June. For the main title, this means sales are roughly where the sales were for the 2nd and 3rd issues. This gain puts Darth Vader's sales in July above the sales for the 2nd issue. If retailers find the proper sales level for these titles close to where they currently are, the main Star Wars title will have unseated Batman as the number 1 ongoing monthly title. Kanan: The Last Padawan shed only 4,000 copies from last month, so it looks like this title is close to stabilizing it's sales. If Kanan settings between 40,000 and 50,000 copies, this will be a huge win for Marvel. Dark Horse put out a Clone Wars series based on the Clone Wars animated show and that title was cancelled after 12 months due to low sales. Take a look at the Star Wars Sales Estimate tab above and please read the blog posting July 2015 comics sales estimates online; Archie #1 tops 100k copies. Wizard Magazine was a popular monthly periodical that began publishing in July 1991 and features articles about comic books. Fans of comics in the 1990s were eager to consume news about which comics where hot and rising in value and Wizard was more than happy to cater to this crowd. A few years after this magazine started, Wizard began producing comics in conjunction with comic publishers that featured in-continuity stories for popular titles. These comics were numbered 1/2 and were available to readers of the magazine who sent away for them and paid for the shipping costs. It was only natural that Dark Horse's popular Star Wars line would be featured in Wizard 1/2 comics. Wizard 1/2 issues were published for Star Wars: Boba Fett, Star Wars: Episode I - The Phantom Menace, and Star Wars: X-Wing Rogue Squadron. 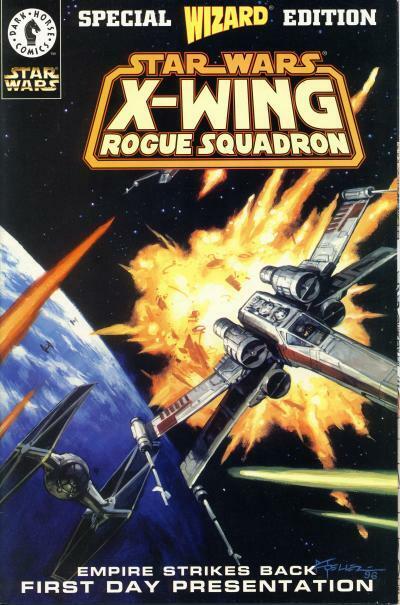 Dark Horse began publishing Star Wars: X-Wing Rogue Squadron in July 1995 and it ran for 35 issues. The comic features the exploits of the X-Wing Rogue Squadron, led by Wedge Antilles. On January 31, 1997 a Star Wars action figure produced by Hasbro was given away to the first 150 people who lined up for the Star Wars: A New Hope Special Edition at select theaters across the U.S. The Star Wars: X-Wing Rogue Squadron Wizard 1/2 comic was published in February 1997, so it only made sense to use this same comic for the free give-away to first day movie goers for The Empire Strikes Back Special Edition on February 21, 1997. The only difference between the mail-away comic and the first day presentation comic is the wording on the cover. Both versions of the comic were printed at the same time. Quite a few of these commemorative issues were given away to movie attendees and they are frequently available on eBay. You can expect to pay $5 - $10 for this comic. Tarkin shook the Dark Lord off, something no one else at the table would have dared to do. "It is immaterial. Any attack made against this station by the rebels would be a suicidal gesture, suicidal and useless-regardless of any information they managed to obtain. After many long years of secretive construction," he declared with evident pleasure, "this station has become the decisive force in this part of the universe. Events in this region of the galaxy will no longer be determined by fate, by decree, or by any other agency. They will be decided by this station!" A huge metal-clad hand gestured slightly, and one of the filled cups on the table drifted responsively into it. With a slight admonishing tone the Dark Lord continued. "Don't become too proud of this technological terror you've spawned, Tarkin. The ability to destroy a city, a world, a whole system is still insignificant when set against the force." "'The Force'" Tagge sneered. "Don't try to frighten us with your sorcerer's ways, Lord Vader. Your sad devotion to that ancient mythology has not helped you to conjure up those stolen tapes, or gifted you with clairvoyance sufficient to locate the rebels' hidden fortress. Why, it's enough to make on laugh fit to-"
Tagge's eyes abruptly bulged and his hands went to his throat as he began to turn a disconcerting shade of blue. "I find," Vader ventured mildly, "this lack of faith disturbing." Those sentences, from the Star Wars novel, contain dialogue that was modified for the final movie. The script for Star Wars went through many changes both before and during the shooting of Star Wars. Additionally, editing played a large role in what ultimately ended up on the screen. The novel came out 6 months before the movie and differences in the dialogue and scenes from those in the finished movie were inevitable. The same is true for the Marvel Star Wars comic adaptation. 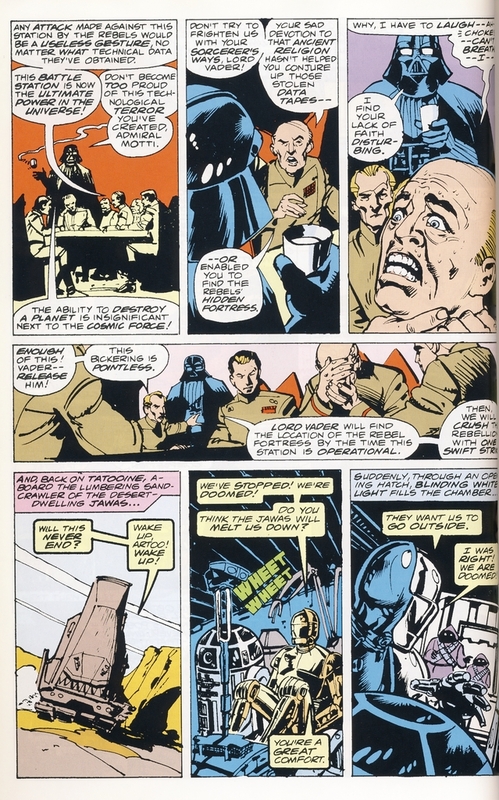 The top 3 panels from page 10 of Star Wars #1 portray the same sequence described in the book. Darth Vader standing behind Governor Tarkin uses the force to retrieve a cup. Exactly how would Vader drink from the cup? It is an awkward moment which thankfully was left out of the movie. It makes sense that Marvel Comics offered a Lando #1 second print quickly after the issue came out. Lando #1 took 2nd place in the top 10 selling comics for the month of July, followed by Star Wars #7 in 4th place, and Darth Vader #7 in 6th place. Does anyone have any doubts which title will be #1 when the Force Awakens adaptation is released? Head on over to The Comics Chronicles to read more. In the Expanded Universe, those stories that take place outside the movies and are now deemed Legends, one area of intense discussion by fans has been how Force ghosts work. We see Obi-Wan's Force ghost in The Empire Strikes back on Hoth and Dagobah. Luke Skywalker is visited by the Force ghosts of Obi-Wan Kenobi, Yoda, and Anakin Skywalker at the end of the Return of the Jedi. Marvel sort of visits this idea in Star Wars #92 when they have Luke interact with Obi-Wan Kenobi, Yoda, Darth Vader, and Anakin Skywalker in a series of dream sequences. Whether or not Luke was visited by Force ghosts in Star Wars #92 or those visits are just dreams is not terribly important to the story. What was probably important to Marvel is it gave them a chance to put Darth Vader on the cover of a Star Wars comic post Return of the Jedi. The previous cover appearance by Darth Vader was a couple issues earlier on Star Wars #90. This would be the last cover to feature Vader in the original Star Wars title. 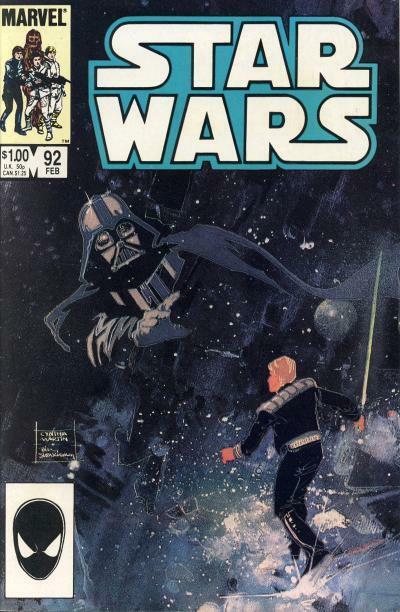 The cover is an impressionistic painting by Cynthia Martin and Bill Sienkiewicz showing Luke Skywalker confronting Darth Vader which is a key aspect of the story. In the issue, Luke is haunted by a previous failure on the planet Belderone from Star Wars Annual #3 and Vader represents that failure. The cover to Titans #92 has the same layout as Star Wars #92 but with an additional surprise... Yoda! Yoda only appeared on one cover in the original Star Wars title, Star Wars #50. 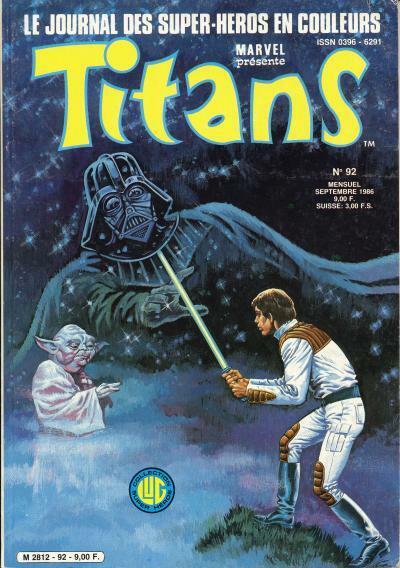 This painted French cover is not impressionistic but instead is done in the same realistic style as the majority of the Titans' Star Wars covers. It is hard to decide which is better; the Cynthia Martin and Bill Sienkiewicz collaboration is a smart choice for a dream sequence, but the French cover features a rare appearance by Yoda. Star Wars: Lando #1 came with the standard assortment of variant covers that we have come to expect from Marvel's Star Wars titles. 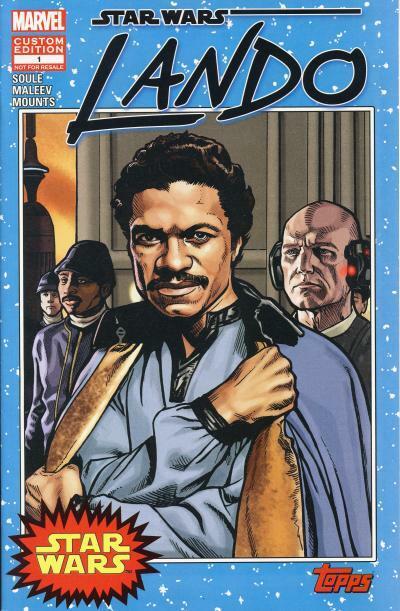 At the 2015 San Diego Comic Con in July 2015, Marvel distributed exclusive copies of Lando #1 which stood out from the other covers, the Topps variant drawn by Randy Martinez. The art on the cover is not spectacular like the Alex Ross variant. It is a nicely rendered drawing of Lando Calrissian with his aide Lobot and his posse of Cloud City guards. The image is meant to look like a picture right out of The Empire Strikes Back and it succeeds at doing that. What makes this cover stand out however is the design. The star infested blue border with the Star Wars logo in the starburst is based on the now classic design for the first Topps Star Wars trading cards from 1977! 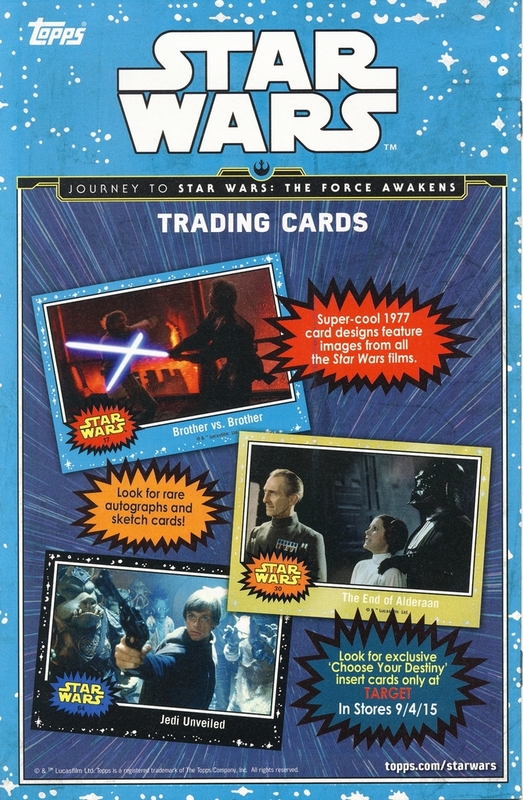 Topps is a trading card company with a rich history of printing Star Wars trading cards. 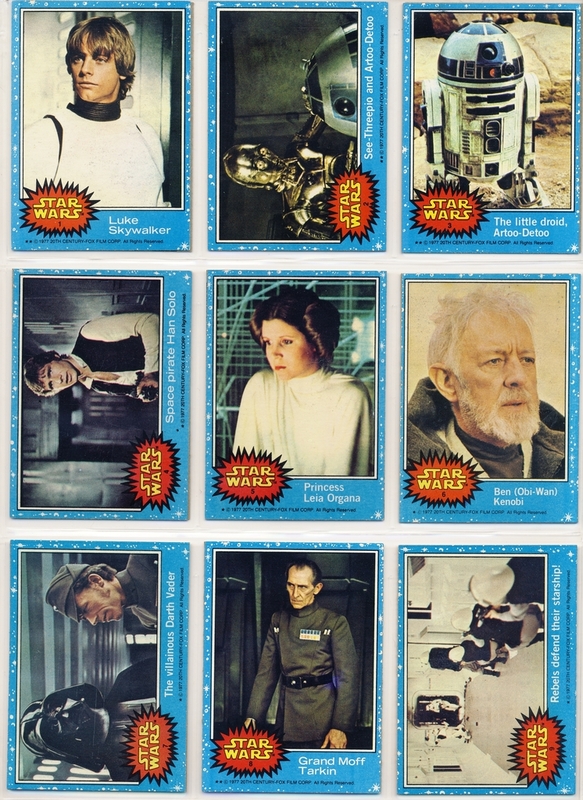 The first set of 66 Topps Star Wars trading cards were printed in 1977 to coincide with the release of the movie. The cards were a hit and Topps went on to print 4 more sets of 66 trading cards for Star Wars. 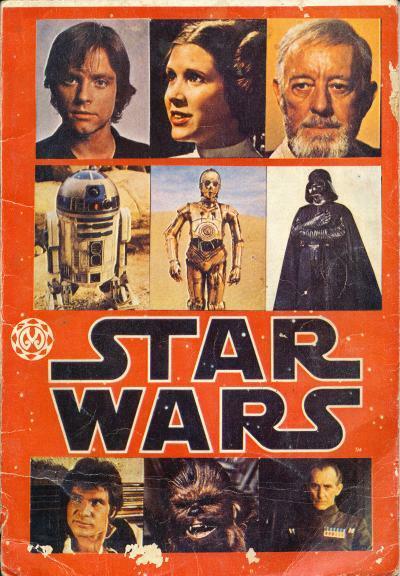 The trading card that looks the closest to the comic cover was printed in 1980 Topps Empire Strikes Back Series II trading card set. 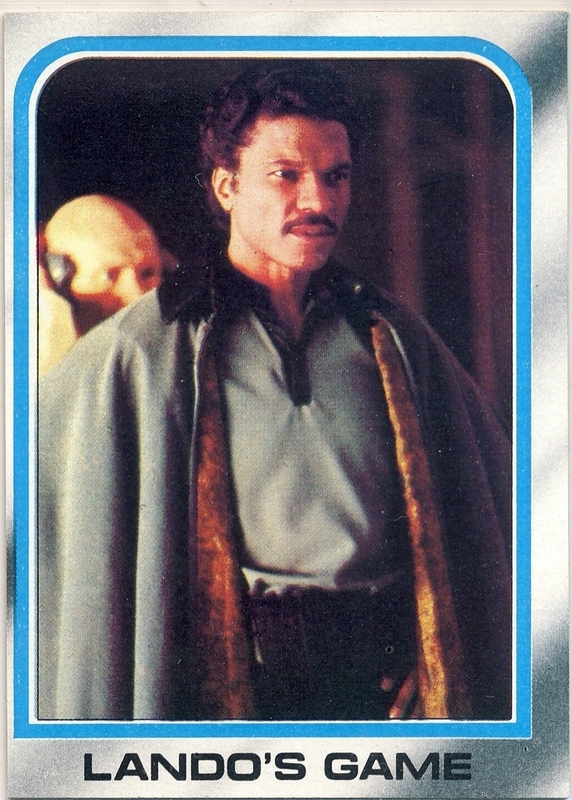 It is card #198 and is titled Lando's Game. This comic variant was distributed in a poly bag which contains 2 trading cards inside. There is no mistaking this comic as anything but a collaboration between Marvel and Topps. The back cover contains an ad for the Topps contribution to the upcoming Journey to Star Wars: The Force Awakens promotion that is occurring in August 2015 to generate excitement for the new movie in December 2015. Topps is hoping nostalgia for the original cards will help drive sales for the new trading card set they are advertising. I speculate that when Topps drew up plans for this comic, there must have been some thinking that if this comic sold well and comic fans demanded it, Topps would commission Marvel to produce more trading card variant covers like Marvel's current action figure variant covers. This comic can be found on eBay and sells for $10 - 15. At the 1976 San Diego Comic Con, the first Star Wars poster was sold for $1 to promote the Marvel Comic adaptation of the Star Wars movie. The artist for that poster is Howard Chaykin who was tapped to provide the art for the adaptation. The cover to Star Wars #1 is based on that poster. Alex Ross is a comic book artist known for his painted covers which depict the characters realistically. Ross' variant cover for the latest Star Wars #1 is a homage to the original Star Wars #1 cover. The homage cover is a terrific remake of the classic cover. Our heroes look more like the actor's who portrayed them, which is not surprising considering Ross' tendency to provide such detail. The Death Star, TIE, Y-Wing, and X-Wing Fighters are rendered movie accurate. The painting looks like the original cover has come to life by providing depth that the original cover lacked. The inclusion of the character box in the upper left hand corner rounds out the retro style this cover invokes. I like that the text blurbs on the original cover were not used as they would have obscured this incredible art! The Alex Ross variant was distributed in a 1:50 ratio. It was probably the most anticipated cover for the new Marvel Star Wars title and initially sold for $75 or more. These days, the cover can be found for $30 - 50 on eBay.